Welcome to Cookbook Week on Macheesmo! I’ll be posting recipes from five cookbooks this week and giving away copies! All winners will be announced next Friday (11/14). The marshmallow industry should be on high alert. While it’s pretty tough to beat the idea of roasting marshmallows over an open fire and smashing them between some crispy graham crackers with gooey chocolate, I think I might actually like this recipe for peach s’mores even better. Don’t get me wrong, I won’t be bringing brie on my next camping trip, but the flavors in this simple dessert snack are just out of this world. It’s a simple combo, but the slightly salty and creamy brie paired with good chocolate and sweet peaches is really incredible. I could’ve eaten a huge tray of these peach s’mores by myself. Just crazy good. While I’m not much of a sweet tooth, I love recipes like this that add a little salty touch to normal desserts. It’s the kind of fun twist that makes Joy The Baker’s new book, Homemade Decadence, such a treat. Watch out marshmallow companies! 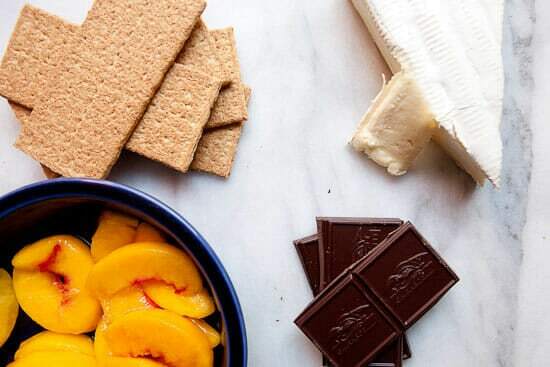 These Brie and Peach S’mores might just win the day. From the Homemade Decadence Cookbook! 2) Break graham crackers in half and lay them out on a baking sheet. On one half, add chocolate and top with brie. On the other half add thin sliced peaches. 3) Broil for 30-45 seconds. 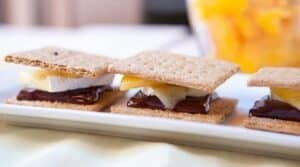 4) Remove and make sandwiches with each s’more. Chow down. While the original recipe for these peach s’mores calls for fresh peaches, I wasn’t able to find any this time of year that really called out to me, so I just grabbed some frozen ones, thawed them, and sliced them thin. To make these beauties, just lay out some crackers on a baking sheet and pile on chocolate squares and brie. For sizing the brie slices, imagine a smashed marshmallow. You want a smashed-marshmallow-sized piece of brie on each one. Okay… barely a recipe, but still good! The only real trick to these beautiful dessert snacks is the broiling. You have to keep a close eye on them and the timing will most likely vary depending on your broiler. My broiler is really spicy hot so about 30-45 seconds under there was just the right amount to soften the brie and melt the chocolate. You might need a bit more though. Just watch it closely. To be honest, I don’t own a ton of sweets/desserts books because I just don’t have a huge sweet tooth! I prefer a bag of chips over a cookie any day of the week. But, I already have like 10 recipes in this book earmarked. Joy not only has an award-winning blog, but has a completely genuine and lovely writing style. It’s infectious and will make you want to bake one of her creations. And oh those recipes. She has completely mastered the idea of ditching the cloyingly sweet desserts for a more measured mix of salty, creamy, and just-sweet-enough. Salty Pretzel Crust! Apple Pie with Cheddar and Bacon! Brown Butter Cupcakes! If you’re a fan of good baking and great writing, you could do worse than grab a copy of Homemade Decadence. Good luck everyone and make sure to check back tomorrow for the last installment of cookbook week! This is very intriguing as I would not ever have thought to pair the cheese and chocolate. Makes me want to give it a try. I bet this would be good with nutella! Joy is incredible! I’d love to win a copy of her book! Wonder how it would taste with apple instead of peach? Either way, I want to try it!! Peaches! Never thought of that. Joy is a genius. These look amazing! i too prefer savory, crunchy, salty, garlicky, spicy, etc stuff over sweets, except for ‘that time of the month’ then give me chocolate or something sweet to eat :) !! 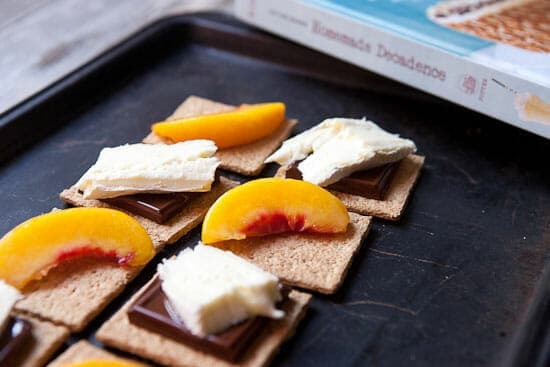 Hmmm, never thought of peaches and cheese in smores but being a sweets person I would def try them! Savory smores…what a great idea! 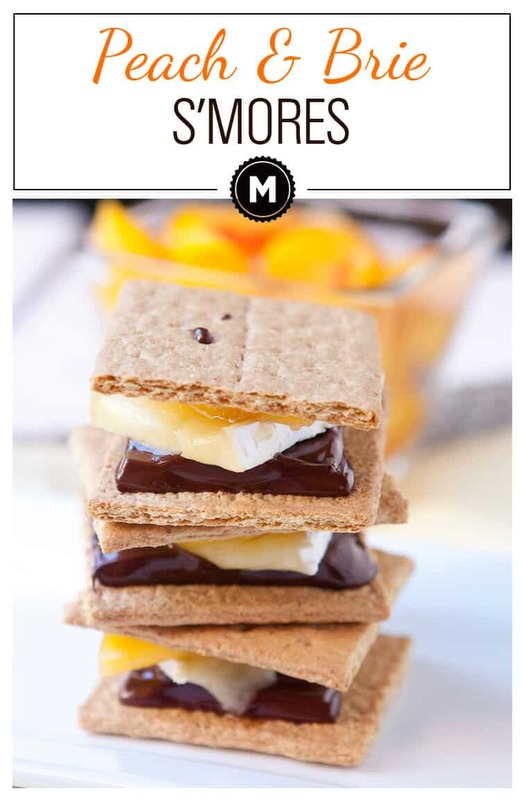 Love Joy’s blog and I love the looks of these s’mores! This concept sounds very intriguing. Like Macheesmo, I favor more the salty than the sweet. This book could be right up my alley. Who doesn’t love a good dessert cookbook?!? This sounds divine. Yum. Perfect for my next wine club! I am really unsure how I feel about this, but I’d definitely try it! Oh my! Brie, peaches, chocolate! What is not to love?? Love Joy and would love to win this book! This look so fancy! I mean really simple to put together but so elegant! I wonder though, does the recipe using fresh peaches require peeling them first? I’ll definitely try this with frozen until next year’s fresh ones come in. Thanks for sharing! Hey Jessica. Yes… if you use fresh peaches you should peel them first! I admit this sounds strange to me. But I would be willing to try it. Not a combo I would of thought but would love to try! never would have thought of this. yum! Nothing better than peaches w/ Brie! I’m addicted to cookbooks, I read and collect them like novels. Would LOVE to add Joys to my collection. 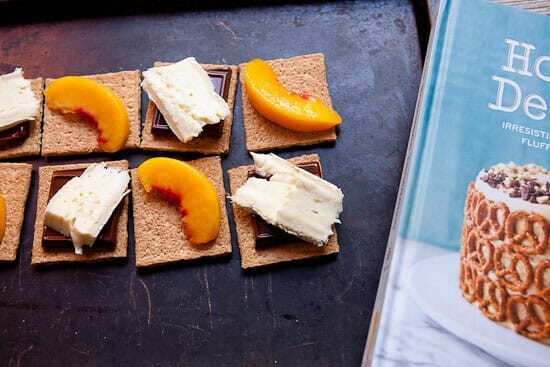 Peaches and brie are already a winning combination, but adding s’mores into the picture? Now that’s genius. I think all of my teeth are sweet tooths. I wish I could be JTB’s neighbor because her blog makes me drool… all the time. Her recipes have never steered me wrong! I would love to win this cookbook — thanks for the chance to win it! I never thought of dressing up the flavor combo in s’mores this way! I’m going to try this for sure! Wow, amazing dessert. Would love to try it! Unlike you, Nick, I have a MAJOR sweet tooth, and this book looks divine! This looks so good. Wish it was still peach season! Been following Joy the Baker’s blog for quite a while now, and she never disappoints. I’d love to try some of the recipes from her cookbook. These have been on my radar for awhile. Finally made them tonight and kicking myself for not making them sooner. Absolutely deliciously divine! « Curry Egg Salad + Easy Gourmet Recipes Home » Lentils and Salmon + My Book!